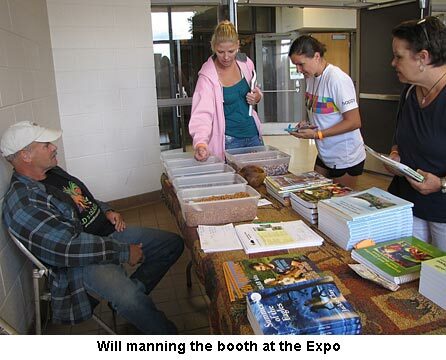 Will and I attended the Expo on Saturday and Sunday, taking our Seed Treasures booth, seeds, and vegetables and promoting Backwoods Home and Self-Reliance magazines, of course. I gave the keynote address each day, one on canning, the other on gardening and seed saving. Both were well attended by excited and very interested people. After the workshops, we had a chance to visit with many of these people at our booth and answer even more questions. Needless to say, both Will and I were pretty tired last night. The gardens are doing extremely well. 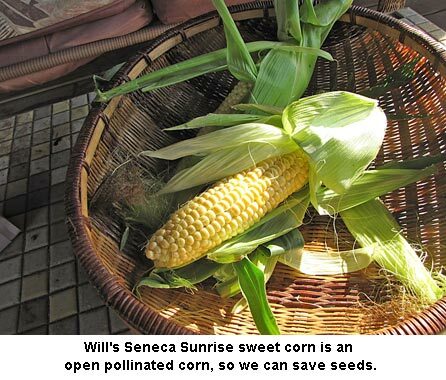 Friday evening I picked two ears of Will’s Seneca Sunrise sweet corn for us to try. Oh my! It was SO good I almost went back for a dozen ears more! The ears were nearly eight inches long, had 14 rows of delectable, nicely sweet, tender corn. And Will checked out the Bill Bean tomatoes and found one was ¼-inch short of being the same size as a 5-quart ice cream pail. And it’s still green, not ripe! We think it’s going to be over 4 pounds easily. I’m so happy the Providers are providing for you as they do us! Mine gave me so many beans I gave up and let them go to seed. I ran out of room to put the jars!!! (I’m sneaking jars onto the shelves Will built and said “These are NOT for food!” He hasn’t complained yet…. 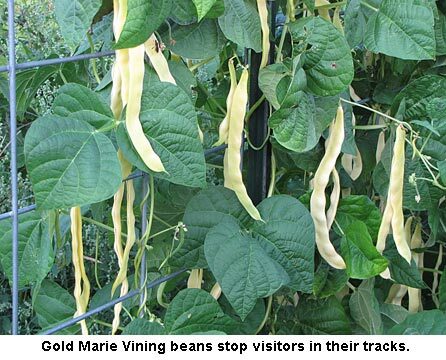 We too love the Provider’s taste and meatiness as well as them putting on beans until it freezes…hopefully weeks down the pike. We were real happy to get to meet you! It’s the biggest reason we do these shows. We feel that all like minded folks are connected and family too. Looking forward to seeing you next year!! No, Don, he wasn’t bluffing; the tomatoes are huge. Check out the new blog for proof. And I couldn’t get the tape measure into the cage of the biggest one! Yeah, our leaves are starting to turn; birch and maple. Sigh. We need a longer fall!!! I want photo evidence of this monster tomato. I will not take my fathers word for it he likes to bluff sometimes. Love you and miss you guys. The feilds and gardens look amazing. I notice every year everything gets better. Love you guys.